The Al trait can be transmitted by either autosomal dominant, autosomal recessive, or X-linked modes of inheritance. It is caused by mutation or altered expression of genes such as: enamelin, ameloblastin, tuftelin, MMP-20, and kallikrein.,, According to the phenotypes and clinical aspects, it can be classified into four types: hypoplastic, hypomaturation, hypocalcified, and hypomaturation–hypoplastic with taurodontism. The hypoplastic type accounts for 60%–73% of cases and affects mainly females. The enamel is usually thin but of normal hardness, and there is a deficiency in the quantity of enamel that is properly mineralized. The surface is usually smooth but with localized areas of thicker enamel resulting in an abnormal crown contour. Alternatively, the enamel may be pitted or have horizontal or vertical ridges. The crowns appear to be hard and shiny and have normal to opaque white or yellow-brown color and may be malformed. The hypomaturation type affects 20%–40% of cases and usually occurs in males. It is caused by defect in the final growth and maturation of enamel crystallites. The thickness of the enamel is initially normal; however, it is lost soon after eruption because of its poor mineralization and reduced hardness, thereby exposing the underlying dentin. Hypocalcified AI is thought to result from a defect in initial crystallite formation followed by defective growth. It is seen in approximately 7% of individuals affected by AI. The enamel is insufficiently mineralized and extremely soft and clinically appears as chalky and dull in color with the susceptibility of a rapid break down. Literature supports that irrespective of the subtype AI patients show similar oral complications such as extensive loss of tooth tissue, poor esthetics, and tooth sensitivity., Pulp and dentin are usually normal, and the teeth are usually caries resistant. Other dental anomalies associated with AI include abnormalities in dental eruption, congenitally missing teeth, pulpal calcifications, root and crown resorption, hypercementosis, root malformations, taurodontism, and open bite malocclusion. In addition to causing functional and esthetic concern, it also has a profound psychological impact affecting the individual's self-esteem and social interactions. Since they are not conditions caused by neglect and cannot, yet, be prevented, it behooves the dentists to exercise their best skills to alleviate the physical and metal suffering which they produce. This clinical report outlines the management of children with hypoplastic type of AI. A 12-year-old boy reported to the department of pedodontics and preventive dentistry, with the chief complaint of generalized tooth sensitivity to both hot and cold. He also expressed extreme dissatisfaction with his appearance while smiling. A detailed medical, dental, and social history was obtained from the parents. The dental family history revealed that none of parents or siblings suffered from similar dental conditions. The medical history was noncontributory. A detailed extra- and intraoral examination and radiographic evaluation were performed. Clinical examination of the patient showed that the enamel of all the teeth was hypoplastic and yellowish. The surfaces of the teeth were rough, and the enamel covering the anterior teeth was very thin [Figure 1]a,[Figure 1]b,[Figure 1]c. Oral hygiene was not satisfactory, with evidence of chronic marginal gingivitis. Radiographic investigation included an orthopantomogram (OPG). OPG revealed completely resorbed roots of 63, 75, 83, 84, and 85. Crowns of all teeth showed reduced enamel thickness with normal dentin. Root morphology of all teeth was completely normal [Figure 2]. Figure 1: (a) Preoperative view. 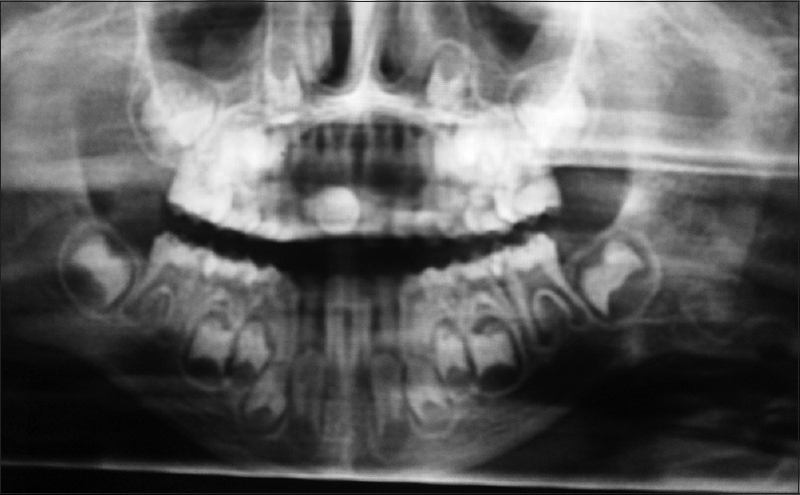 (b) Preoperative view showing maxillary arch. (c) Preoperative showing mandibular arch. Figure 2: Orthopantomogram of the dentition. All the treatment modalities were discussed with the parents, and treatment plan was developed taking into account the disorder's severity, the child's age, and his psychological condition. After considering all of the treatment options, it was decided to place direct composite veneers on the permanent anterior teeth and stainless steel crowns (SSCs) on permanent molars. In the initial phase of treatment, preventive measures were taken to improve dental and periodontal health and to modify the child's attitude and behavior toward dental treatment which included diet analysis and advice, extensive oral hygiene instructions, and oral prophylaxis. On subsequent appointments, preformed SSCs (3M ESPE) were placed following minimal slice preparations of the teeth bilaterally at each visit so as to balance the occlusion and maintain the vertical dimension [Figure 3]a, [Figure 3]b and [Figure 4]a, [Figure 4]b. Figure 3: (a) Stainless steel crowns in relation to 16 and 26. (b) Stainless steel crowns in relation to 36 and 46. Figure 4: (a) Clinical view showing posteriors in occlusion (right side). (b) Clinical view showing posteriors in occlusion (left side). The permanent maxillary and mandibular anteriors were veneered with composite. The teeth were cleaned with pumice using rotary bristle brush, followed by acid-etching with 35% phosphoric acid for 30 s and rinsing with water spray. The labial surfaces of the maxillary and mandibular incisors and canines were then directly restored with hybrid resin composite (Ivoclar Vivadent, Te-Econom Plus). Finishing and polishing were done using Sof-Lex discs and Shofu composite polishing kit [Figure 5]. Figure 5: Postoperative view showing veneering in maxillary and mandibular anteriors. A regular follow-up is maintained after 3 months, wherein the patient and parents related to improved esthetics and relief in dental sensitivity, improving his masticatory function and quality of life. A long-term follow-up is required so that a definitive treatment can be performed. 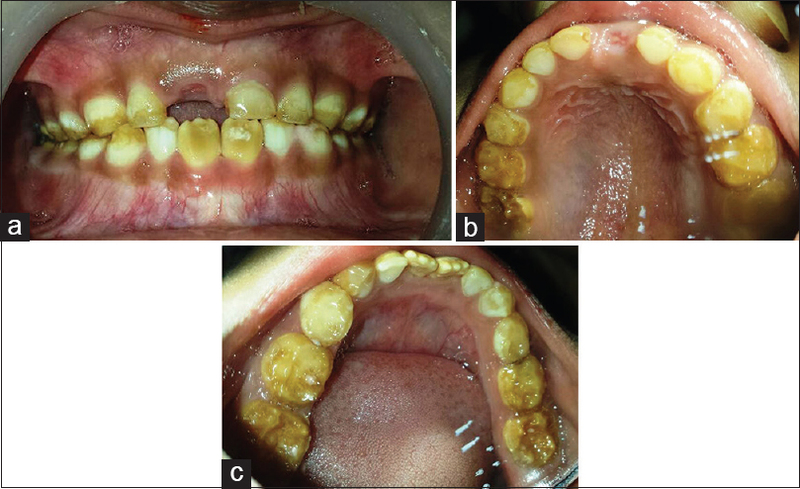 A 7-year-old girl reported to the department of pedodontics and preventive dentistry with the chief complaint of difficulty in chewing and yellowish discoloration of teeth. The family history revealed that the patient's father and brother had similar dental findings. On examination, the patient had mixed dentition. The deciduous teeth showed yellowish-brown discoloration and thinning of enamel involving incisal third, whereas in permanent teeth, entire enamel was involved along with marked attrition on the occlusal surface [Figure 6]a,[Figure 6]b,[Figure 6]c. The radiographic examination revealed that 61, 72, and 82 were close to exfoliation [Figure 7]. The SSCs were placed on all permanent first molars following minimal slice preparations to alleviate tooth sensitivity, improve masticatory efficiency, and maintain the vertical dimension [Figure 8]a, [Figure 8]b and [Figure 9]a, [Figure 9]b. The patient is kept on regular follow-up for evaluation of eruption of all permanent teeth and subsequent treatment. Figure 6: (a) Preoperative view (b) Preoperative view of maxillary arch (occlusal view) (c) Preoperative view of mandibular arch (occlusal view). 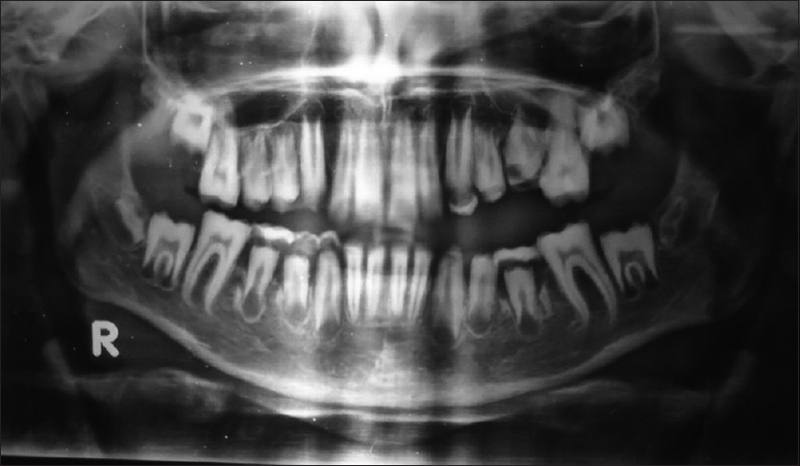 Figure 7: Radiographic appearance of dentition in orthopantomogram. Figure 8: (a) Stainless steel crowns in relation to 16 and 26. (b) Stainless steel crowns in relation to 36 and 46. Figure 9: (a) Postoperative view showing posteriors in occlusion (right side) (b) Postoperative view showing posteriors in occlusion (left side). Children with AI can have high dental needs and may present many dental challenges. A treatment plan for cases of AI depends on many factors such as age, type and severity of disorder, and socioeconomic status, and the intraoral situation at the time treatment was planned., Usually, the treatment will extend over many years, and long-term success will depend on regular attendances for restorative procedures and the maintenance of a high level of oral care. Early identification and preventive interventions are critical for children and adolescents with AI to avoid the negative social and functional consequences of the disorder. Historically, some patients with AI have been treated with multiple extractions followed by construction of complete dentures. These options are psychologically harsh, especially in adolescents. Currently, the different materials and methods for restorative procedures are available that include the use of composite resin, polycarbonate crowns, SSCs, glass ionomer cement, and functional maintenance dispositives to restore a mutilated dentition. In most cases, full coverage is desirable for posterior primary teeth due to the extensive loss of enamel and also to prevent further loss of tooth structure. In adults or children with complete permanent dentition, a prosthodontic treatment can be performed with adhesive techniques, full porcelain crowns, porcelain-fused-to-metal crowns, overdentures, inlay/onlay restorations, or crowns. However, the oral rehabilitation of children with primary or mixed dentition is more complex since no definitive treatment can be done during periods of growth and until the end of eruption of permanent dentition is accomplished. In such cases, SSCs are the most effective type of restoration. In the present clinical report, SSCs were placed on the first permanent molars. The SSCs are extremely durable, relatively cheap, and subject to minimal technique sensitivity during placement and offer the advantage of full coronal coverage. 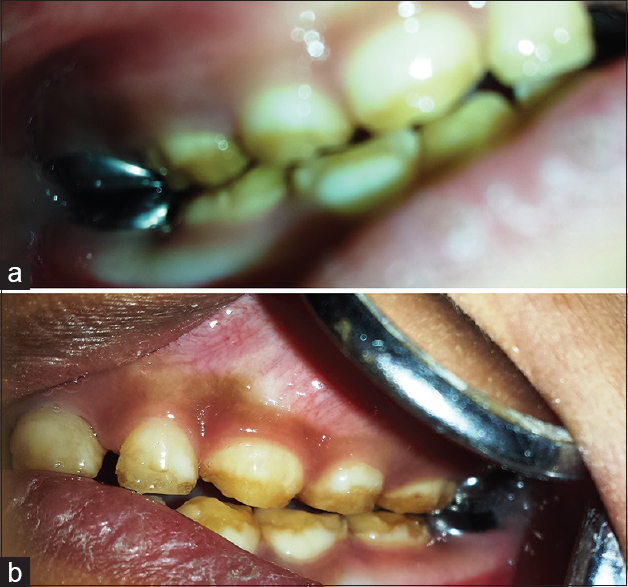 A definitive treatment with porcelain fused to metal crowns can be done once facial maturity has been reached. In the maxillary and mandibular anteriors, direct composite resin veneering was done to mask the discoloration and improve the crown morphology. In adolescents, porcelain veneers are also likely to be useful; however, their use with AI has not been extensively reported. Porcelain jacket crowns which provide esthetic permanent restorations have reportedly been successful in affected adults, but their use in young patients is contraindicated because of the presence of large pulp chamber and the likely need for frequent replacement due to passive eruption. AI affects both form and functions and can have a significant psychological impact. Although early oral rehabilitation poses numerous technical difficulties and challenges, they are outbalanced by the benefits, and it has on the patient's quality of life. Henceforth, early treatment must be performed with attention, to reestablish both the functions and to prevent serious problems in the future occlusion and social adaptation of the patient. Neville BW, Damm DD, Allen CM, Bouquot JE. Textbook of Oral and Maxillofacial Pathology. 2nd ed. Saunders: Elsevier; 2005. p. 89. Gadhia K, McDonald S, Arkutu N, Malik K. Amelogenesis imperfecta: An introduction. Br Dent J 2012;212:377-9. B9.2:37 B, Holmgren G. Amelogenesis imperfecta: A genetic study. Hum Hered 1988;38:189-206. Witkop CJ Jr. Amelogenesis imperfecta, dentinogenesis imperfecta and dentin dysplasia revisited: Problems in classification. J Oral Pathol 1988;17:547-53. Sundell S, Koch G. Hereditary amelogenesis imperfecta. I. Epidemiology and clinical classification in a Swedish child population. Swed Dent J 1985;9:157-69. Stephanopoulos G, Garefalaki ME, Lyroudia K. Genes and related proteins involved in amelogenesis imperfecta. J Dent Res 2005;84:1117-26. Ergun G, Kaya BM, Egilmez F, Cekic-Nagas I. Functional and esthetic rehabilitation of a patient with amelogenesis imperfecta. J Can Dent Assoc 2013;79:d38. Crawford PJ, Aldred M, Bloch-Zupan A. Amelogenesis imperfecta. Orphanet J Rare Dis 2007;2:17. Kwok-Tung L, King NM. 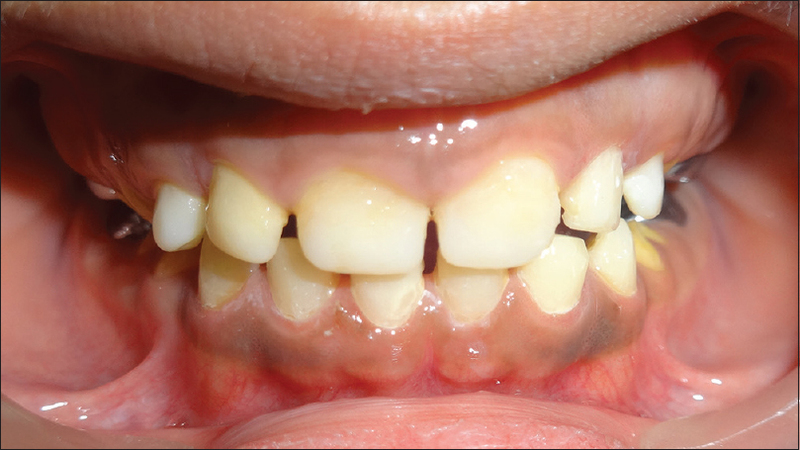 The restorative management of amelogenesis imperfecta in the mixed dentition. J Clin Pediatr Dent 2006;31:130-5. Bsoul SA, Flint DJ, Terezhalmy GT, Moore WS. Amelogenesis imperfecta. Quintessence Int 2004;35:338-9. Lykogeorgos T, Duncan K, Crawford PJ, Aldred MJ. Unusual manifestations in X-linked amelogenesis imperfecta. Int J Paediatr Dent 2003;13:356-61. Collins MA, Mauriello SM, Tyndall DA, Wright JT. Dental anomalies associated with amelogenesis imperfecta: A radiographic assessment. Oral Surg Oral Med Oral Pathol Oral Radiol Endod 1999;88:358-64. Markovic D, Petrovic B, Peric T. Case series: Clinical findings and oral rehabilitation of patients with amelogenesis imperfecta. Eur Arch Paediatr Dent 2010;11:201-8. Papagerakis P, Lin HK, Lee KY, Hu Y, Simmer JP, Bartlett JD, et al. Premature stop codon in MMP20 causing amelogenesis imperfecta. J Dent Res 2008;87:56-9. Cogulu D, Becerik S, Emingil G, Hart PS, Hart TC. 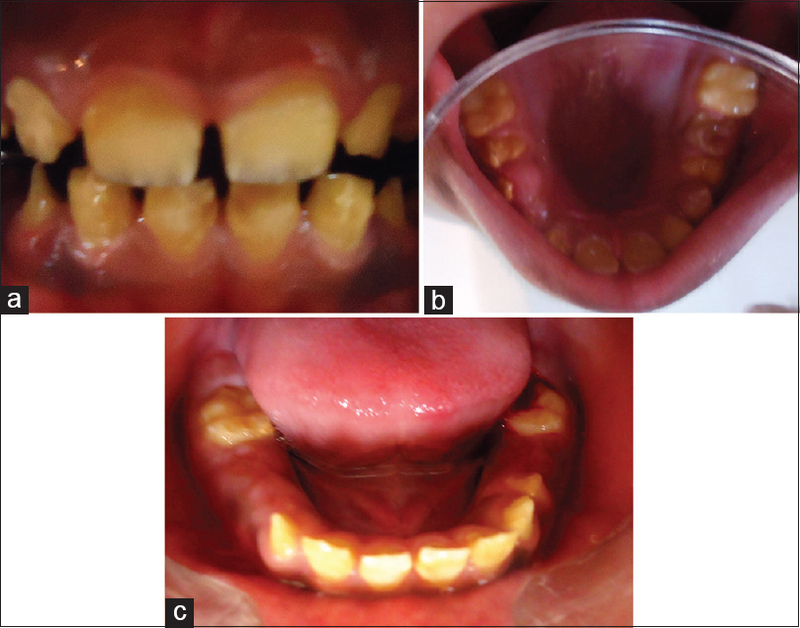 Oral rehabilitation of a patient with amelogenesis imperfecta. Pediatr Dent 2009;31:523-7. Bouvier D, Duprez JP, Bois D. Rehabilitation of young patients with amelogenesis imperfecta: A report of two cases. ASDC J Dent Child 1996;63:443-7. Randall RC. Literature Review for AAPD: Preformed Metal Crowns for Primary and Permanent Molar Teeth. Consensus Conference on Pediatric Restorative Dentistry. San Antonio, Texas; 15-16 April, 2002. Toksavul S, Ulusoy M, TM, Ty M, KM, Ky M, O. Amelogenesis imperfecta: The multidisciplinary approach. A case report. Quintessence Int 2004;35:11-4.